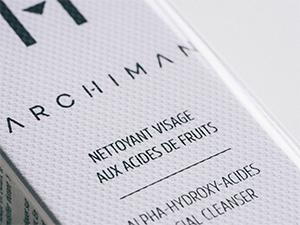 Behind the barbaric name of fruit acids hides exceptional active ingredients that awaken the Male! These substances, that can be found in their most natural state in several different fruits and in sugar cane, are certainly the most powerful and efficient that exist in cosmetics. These two urban skin allies make miracles. The lack of sleep, pollution, exposure to UV lights, stress and a sometimes unbalanced diet have a negative impact on the equilibrium and quality of your skin. To fight against the lack of hydration, imperfections or even the appearance of wrinkles, you can count of fruit acids (also known as AHA). This scientific method of exfoliation is created from using fruit acids that promise a deep reaction to the cells, unlike “mechanical” exfoliation that superficially attacks dead skin through scrubbing. Which Acids for your skin? Each fruit acid has different distinguishing qualities and we are here to help you see clearly in this fruit salad. The primary action of AHA resides in their keratolytic abilities – they weaken the link that retains dead skin cells. When these links are weakened, dead skin cells can be removed from the surface of the skin which encourages the production of collagen and stimulates cell renewal. Lactic acid is a very powerful and efficient moisturizer that makes the skin softer, smoother and brighter. Glycolic acid, deriving from cane sugar, presents the most keratolytic abilities of all AHA. It’s glycolic acid that is responsible for the immediate “new skin” effect after the first application. Citric acid stimulates the collagen synthesis and gives back radiance, reduces wrinkles and slows down the formation of wrinkles. Tartaric acid et malic acid reinforce the skin’s elasticity. And what happens when you go under Acids? That’s it! We told you that fruit acids make miracles! An Acid treatment? Acids react day after day; their reaction is intensified overtime and their results are long-lasting. Two treatments per year, for one to two months, after summer and at the end of winter. All year long, two to three times per week, or even every day for fans. The effects are visible after the first week of application; regular and prolonged use will guarantee radiant and beautiful skin. What goes best with Acids? What is better than the Mediterranean sun, fine sand beaches and a little bit of dolce vita for pampering yourself?